Are you looking for a fast, attractive, and affordable way to improve the interior appearance of your home? With ceramic tile flooring from our company that perfectly matches your sense of style, you can add a new, durable surface to your rooms. From sleek and modern, to rich and classic, we offer a wide selection of stylish floor tiles. Choose ceramic floor tiles with unique designs from high-quality brands such as Design Distinctions™ and Floorcraft™. Building a new home or remodeling the one you already own is a big job, but it's easier when you have quality materials to work with. We recommend choosing ceramic tile flooring for use throughout your residence. This type of tile is elegant because it is covered with a glaze that can be either subtle or patterned. Along with its aesthetic quality, a tile floor made of ceramic is also durable. Ancient ruins in Italy and other areas of Europe have tile that has lasted for more than 2,000 years. This highly moisture-resistant flooring is an obvious choice for your kitchen and bathrooms, but it will also create a fresh look for hallways and living rooms. In addition, with so many options to choose from, we are happy to guide you every step of the way—from selection to installation. Tile floors are suitable for use in any room or area of your home, including porches, hallways, bedrooms, and more. Choose a tile floor made of ceramic from among our stunning and stylish collections. A variety of colors, designs, and patterns are available among our selections. If you're not sure what to pick, one of our friendly and knowledgeable associates will assist you. Tell us where the tile will be used and how your room or rooms are currently decorated, and we'll show you ceramic tile that complements any setting. There are other types of tile, but we think you'll get more than your money's worth from ceramic tile. It's tough enough for use in any room in your home because ceramic is resistant to damage from sunlight and scratches. In fact, ceramic tile is rated from zero to five in toughness, which allows you to choose tile that fits everything from high traffic areas to rooms that are hardly used at all. This flooring is safe, too, because it's naturally slip resistant and fireproof. In addition, the glaze on this type of tile makes it easy to clean and to keep looking beautiful. Ceramic or any other type of flooring is a serious investment, so you want to make sure that you are completely confident in your decision. Your flooring will be in your home for years, so it needs to be something that will stand the test of time in looks and functionality. With an extensive selection of tiles, featuring ceramic along with porcelain and much more, you can count on us to make sure that your every need is satisfied. We don't think you have to spend a lot to improve the look of your home's interior, which is why we only sell discount tile flooring. As a result of our company's buying power, you are sure to get your tile floors for a price you appreciate. In fact, we offer some of the lowest prices on some of the most trusted brands in the flooring business through our extensive network of locally owned flooring stores. Before you start building a new home or remodeling your current residence, don't forget to include flooring in the design. Stop by our showroom to see what's new in ceramic tile flooring and other styles that interest you. Our associates will show you samples of flooring that meets your decorating needs and fits your project budget. Are you worried about who will install your flooring? We are known for our customer-driven service that extends beyond your selection and purchase of the flooring you choose. We offer professional ceramic tile flooring installation as a part of our comprehensive flooring services. With our help, you won't have to concern yourself with hiring a separate flooring installation contractor to finish your project. Rely on us for first-class flooring materials and related services from start to finish. Ceramic tile provides a durable and aesthetically pleasing environment for almost any space in your home. 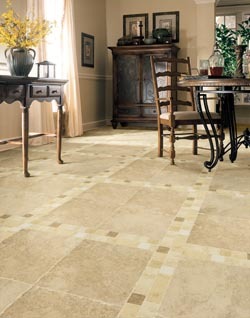 Contact My Floors Flooring America to see our extensive collection of ceramic tile flooring options. We proudly serve Mansfield, Galion, Lexington, Ontario, Shelby, Bucyrus, Mt. Gilead, Mt. Vernon, Ashland, Willard, and Marion, OH.